The British Gazette » Fee-fi-fo-fum, I smell the blood of an Englishman…. 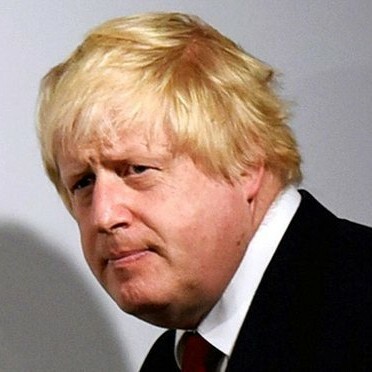 Above, Boris Johnson, Foreign Secretary – for the time being! Which first appeared in “Haue with You to Saffron-Walden” in 1596 by Thomas Nashe – who tells us that the rhyme was then already old and its origins obscure. Today’s Guardian peddles a train of propaganda emanating from Brussels and the mouth of Mr Tusk. Mr Tusk is clearly trying to stir the pot further! His statement is of course complete and utter nonsense! 1. Hard Brexit. This will result in the UK relying on WTO with Brussels help supplying the essential bureaucracy for a transitional period – until the UK establishes it’s own bureaucracy. RESULT: Severe economic slump, Sterling trading BELOW the Euro. A happy Comrade Corbyn who will be Prime Minister with a healthy majority – in all likelihood before May 2020. 2. No Brexit. Brexit cancelled. RESULT: The UK economy in good shape but with a return to the fractured Conservative party in a coalition government with the LibDems following an early General Election in 2018-2019. 3. Soft Brexit. AKA the FLEXCIT of Dr. Richard North and others. This means the UK leaving the EU, rejoining EFTA and never leaving the EEA (Single/Internal market). This will leave the UK economy in good shape but UK politics in a complete and utter shambles! Well there is a delicious piquant irony about it! British Gazette readers will ALL remember themselves or will have read how the Arch Traitor Heath initiated a process that handed the government of this formerly sovereign United Kingdom of Great Britain and Northern Ireland to a foreign power in breach of his Privy Council Oath, causing Her Majesty Queen Elizabeth the Second to be placed in breach of her Coronation Oath and thus Heath committed the Felony Crime of High Treason. In order to do this he repeatedly LIED whilst in office and during the 1975 referendum when he was in opposition. Wind the clock forward to the EU Referendum Campaign earlier this year. Herewith an admission: If the Leave campaigns had taken the advice of this organ and also from Dr. Richard North, it is now clear that they would have LOST the campaign and the public would have voted to REMAIN in the EU. Instead they chose to take the advice of a certain Nigel Paul Farage from Downe within the London Borough of Bromley, in Kent. It is to this “Man of Kent” (Bromley lies east of the Medway) that we all owe a huge debt to as it undoubtedly was Nigel Paul Farage who delivered the victory. Made in that Glorious Summer by this Man of Kent…..
Nigel Paul Farage offered the prospect of choice #1 above! Thus, in order to achieve Brexit, the government has no other option other than to go for choice #3! That is NOT what the public voted for! So here is the delicious piquant irony! The UK was taken into “Europe” on a LIE. And will be taken out of “Europe” on a LIE! Doubtless the Arch Traitor Heath will be spinning with delight in the middle of the hottest cauldron that Hell has to offer it’s most heinous residents!